As people who have come for an Ayurvedic Consultation know, I heartily recommend ” Teach Yourself Ayurveda” by Sarah Lie as an essential accompaniment to healing the Ayurvedic way. Now, another lovely book has come along, which I feel makes an ideal companion to exploring how Ayurveda’s ancient wisdom is relevant to us in the 21st Century. 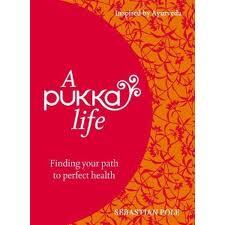 “A Pukka Life”, by the founder of Pukka Herbs, Sebastian Pole, is a very accessible book, with beautiful photography and quality paper that would look good on any bed-side table. The sub-title is “Finding Your path to perfect health” stressing that Ayurveda is not a one size fits all approach. The book’s first chapter will help work out your Ayurvedic constitution, followed by chapters on nourishment; cleansing; rejuvenation; strength and stillness; ecology and relationship. With lots of personal insights, the book is never dry (as some Ayurvedic tomes can be….). For example, there is a sensible discussion on the issue of vegetarianism and how Ayurveda is “primarily, but not wholly vegetarian”- a subject which I find can often lead to heated debates and people wanting things to be black and white. Finally, the book contains a voucher for a free selection of delicious Pukka herbal teas- an added incentive. Enjoy!